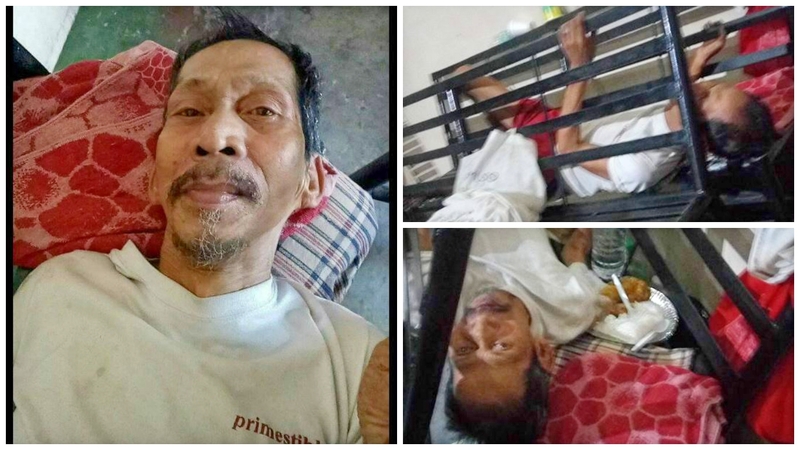 MANILA, Philippines - Photos and videos of a sick old man left alone in the waiting area of a hospital has gone viral on social media after a certain Regine Antuerpia shared them on Facebook. Tatay Alfredo Garcia, 76, suffered from a stroke but was discharged from the hospital a month ago. Just days after his discharge, his child decided to abandon him in the waiting area of Las Piñas District Hospital. Antuerpia, who encountered Garcia in the waiting area, said the elderly is unable to move on his own and relies on other people for food and water. Antuerpia added that the hospital is unable to accommodate Garcia since no one will take care of him. “Nakakaawa kc hindi sya makatayo, tinanung namin kung wala ba syang kasama. Wala daw dinala daw sya ng anak nya sa hospital tapus iniwan nlng sya dun. Hindi na sya binalikan hanggang sa pinalabas na daw sya sa hospital kc walang nag aasikaso sa kanya, pero hindi pa sya magaling. Hindi sya makatayo tinry ng ate ko iupo para makainum umaray sya hindi nya daw kaya.. nakahiga lang sya,” Antuerpia wrote in her Facebook post. In his conversation with Anteurpia, Garcia disclosed that he is not sure whether his child is in Bulacan or Nueva Ecija. He also revealed that he was evicted from the house of his relatives in Imus, Cavite. Based on a report by ABS-CBN News, the said hospital tried to contact the relatives of Garcia. However, his child identified as Lester can no longer take care of him and is hoping an institution would take him into custody. “Base doon sa records, pinauwi po siya ng February 14 or 15, so binalik ito unknowingly sa hospital, deneretso lang po sa waiting area, hindi po nila inane sa E.R. Tinatawagan po iyong kapatid sa phone ng naiwan pati po iyong anak, hindi na po ayaw nila pong talaga kunin,’ Victoria Esplatero, head of Medical Social Services of Las Piñas District Hospital told ABS-CBN. The Department of Social Welfare and Development is expected to take Garcia into their custody soon.